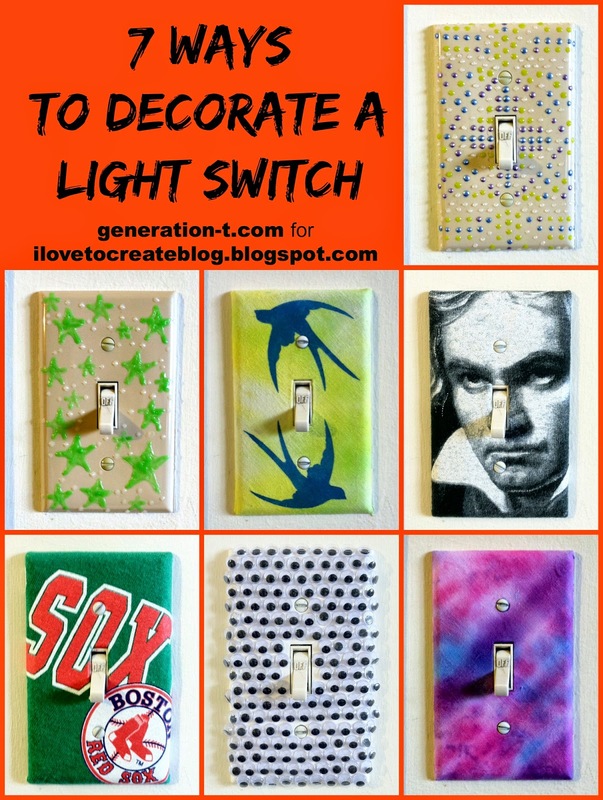 I originally set out to decorate 5 light switch plates, but ended up getting to 7 -- I just couldn't stop! For most of them, I used the new "Always Ready" Aleene's Tacky glues (they arrive in the checkout aisle -- no the glue section -- of JoAnn stores starting in November!). It's smart new inverted packaging that has the glue all ready to go -- in other words, no need to shake the bottle anymore to get the gluey stuff into the tip. They are great -- my only challenge was to remember to store them back in their base, tip down! A light switch plate is a pretty sweet blank canvas -- small in dimension and fairly low-stakes (in case the creative process doesn't go as planned). But when it does work, what fun! Which switch plate theme or technique would you take and run with? 1. Determine your paint color palate. 2. 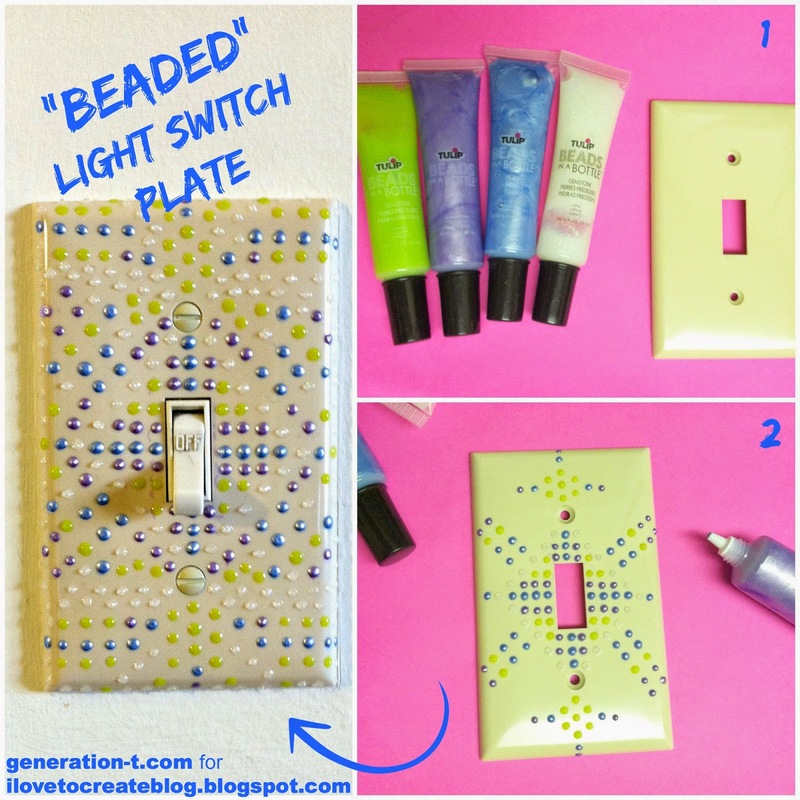 Dot small paint "beads" one color at a time in your desired pattern. 3. 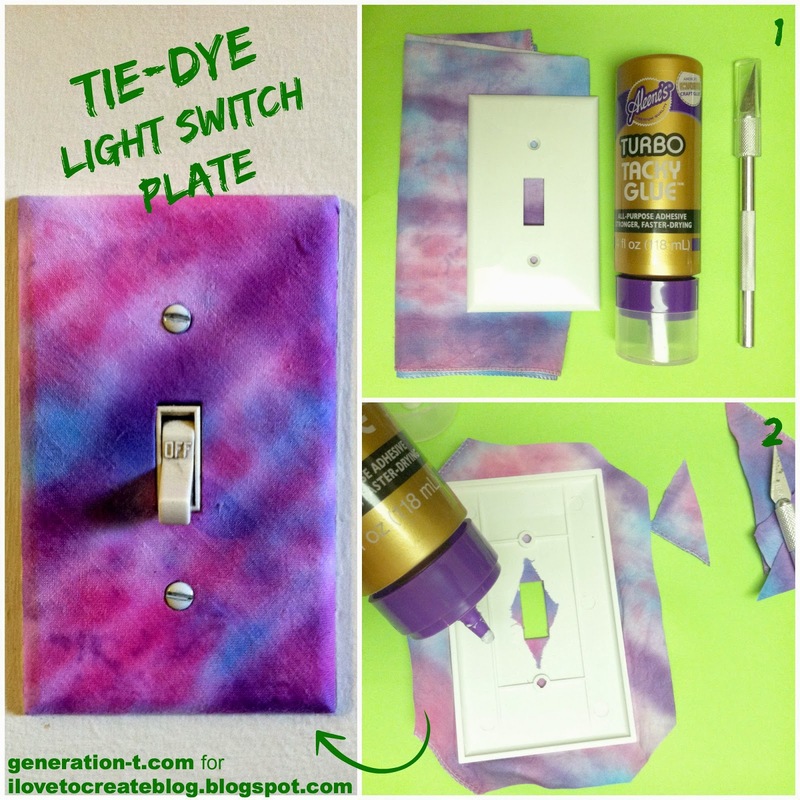 Let dry completely, and attach your colorful, textured light switch plate! 2. Apply glue lightly and evenly to the front of the switch plate, and press it down onto the back of the fabric, leaving a 1" margin on all sides. Trim off the corners and cut an X from corner to corner inside the light switch opening. Fold back the edges and fold back the cut triangle pieces in the center and glue. 3. Let dry completely, and attach the switch plate to the nearest light switch. 2. 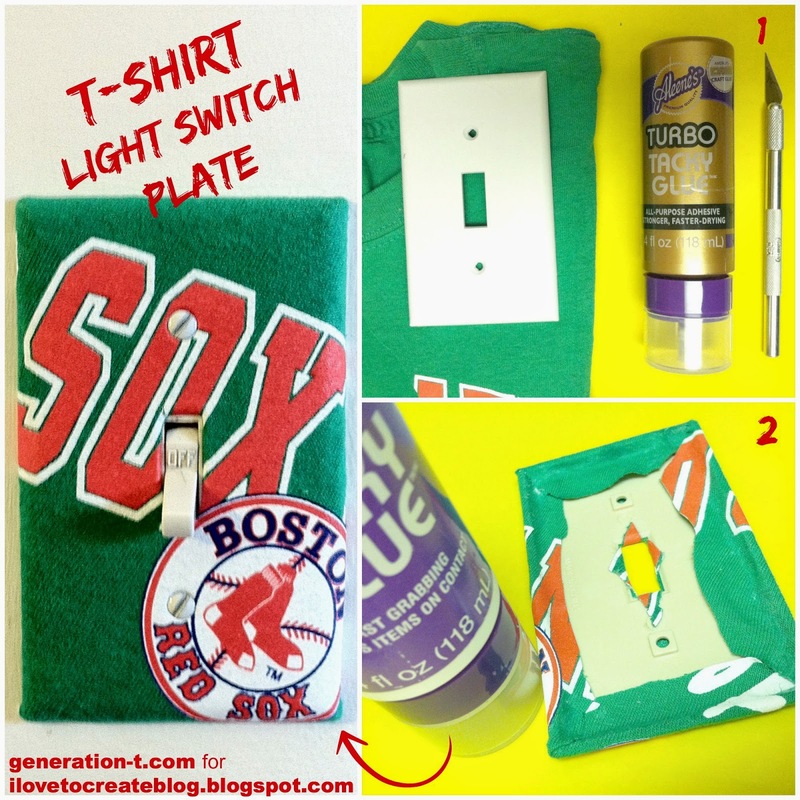 Apply glue lightly and evenly to the front of the switch plate, and press it down onto the back of the T-shirt fabric, leaving a 1" margin on all sides. Trim off the corners and cut an X from corner to corner inside the light switch opening. Fold back the edges and fold back the cut triangle pieces in the center and glue. 2. Center the switch plate upside down on the face, aligning the opening over the nose. Cut an X from corner to corner. Cut around the edges, leaving a 1" margin. 3. Apply glue lightly and evenly to the front of the plate, and press it onto the back of the face, being careful to center it over the X you cut in step 2. Fold back the edges and the cut triangle pieces in the center, and glue. 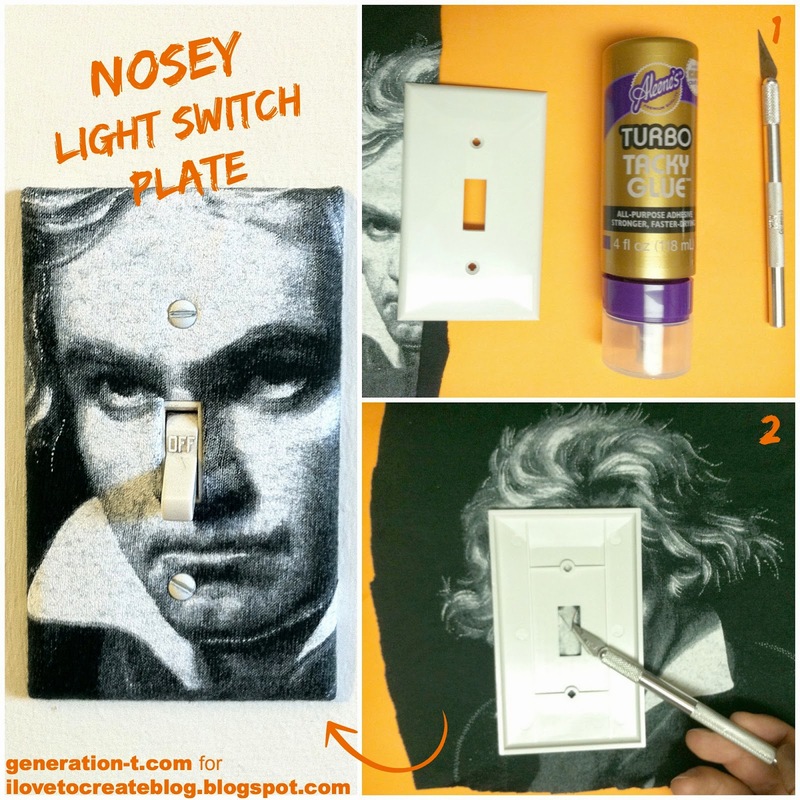 Let dry completely, attach the switch plate to a light switch, and turn Beethoven's nose up and down. 2. 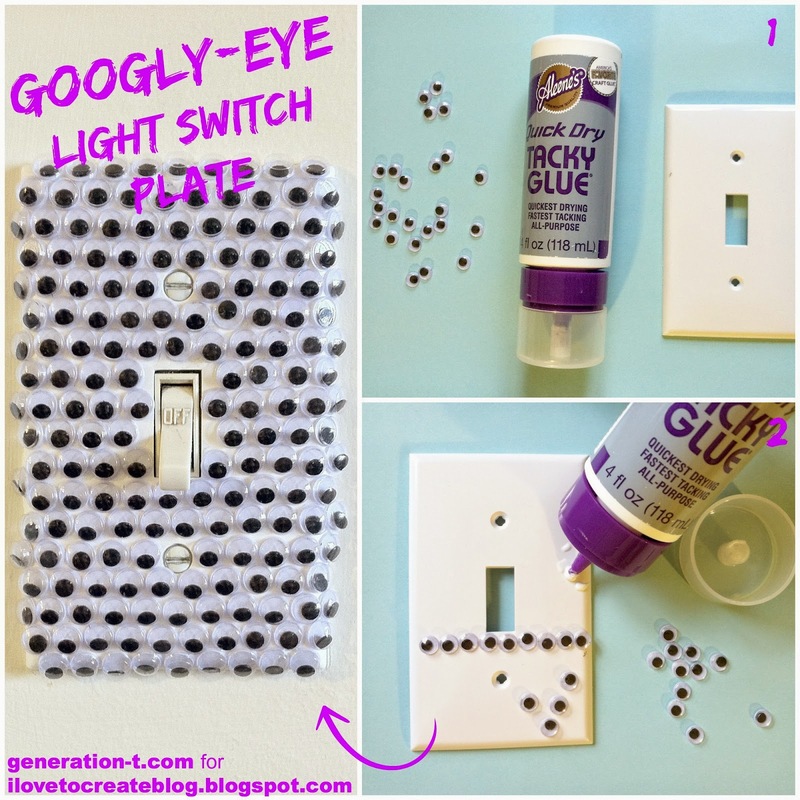 Apply a thin layer of glue in a line across the switch plate near one of the openings (either the rectangular one for the switch or one of the two small ones for the screws). 3. Continue to apply googly eyes in rows, adjusting them so they're straight before they dry completely. Let dry completely, and carefully attach the switch plate to the nearest light switch. 2. 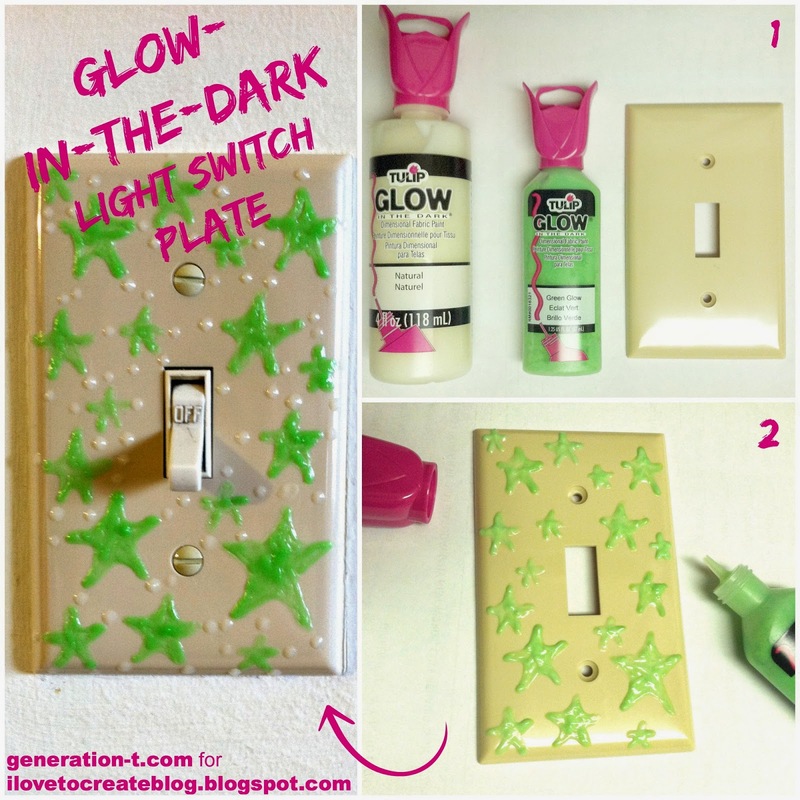 Draw your design free-hand onto the front of the light switch plate--I drew stars, and punctuated them with dots at each point! 3. Let dry completely, install it, and make sure to charge the switch plate sufficiently before checking the glow when you turn out the light. 1. Select a piece of fabric and a small stencil. 2. Apply glue lightly and evenly to the front of the switch plate, and press it down onto the back of the fabric, leaving a 1" margin on all sides. Trim off the corners and cut an X from corner to corner inside the light switch opening. Fold back the edges and fold back the cut triangle pieces in the center and glue. 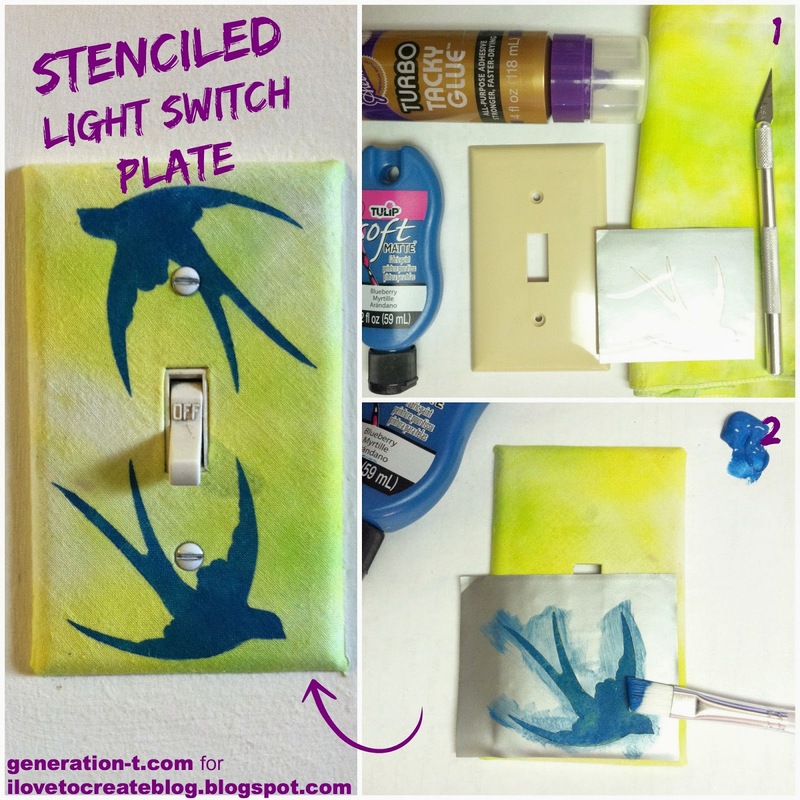 Peel the backing off the stencil and arrange it on the front of the switch plate. Brush the paint lightly over the stencil. 3. Let dry, rearrange the stencil and paint again if desired, then remove the stencil and let dry completely before attaching the switch plate to the nearest light switch.